As it prepares for its highly anticipated debut residency at Privilege Ibiza this summer, RESISTANCE™ now unveils the next round of artists set to perform across the 8-week run. 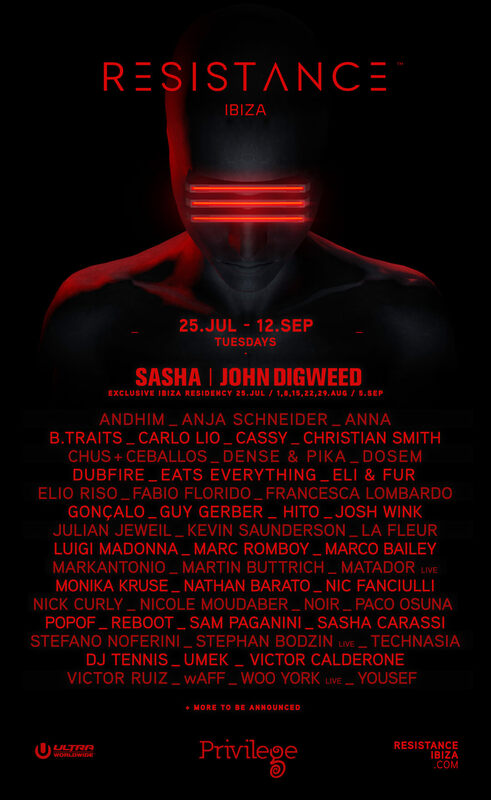 Joining the likes of Sasha & John Digweed (exclusive Ibiza residents), Dubfire, Eats Everything, Guy Gerber, Matador (Live), Nic Fanciulli, Nicole Moudaber, Paco Osuna, Stephan Bodzin (Live) and DJ Tennis already announced, are an additional FORTY-plus world-class acts from the house and techno world. From Andhim, Anja Schneider, ANNA, Cassy, Francesca Lombardo, Josh Wink to Martin Buttrich, Monika Kruse, Noir, Reboot, Sam Paganini, Woo York live and many more, RESISTANCE’s takeover of Privilege this year is not to be missed. View the full lineup here. 2016 saw RESISTANCE™ team up with Arcadia in Miami once again, this time for the highly anticipated North American debut of the legendary ‘SPIDER’ structure. In only its second year, the RESISTANCE™ concept continued to expand at breakneck speed, touching down in ten countries spanning five continents, with events in the USA (Miami), Croatia, South Africa (Cape Town & Johannesburg), Singapore, Indonesia (Bali), Japan (Tokyo), Brazil (Rio De Janeiro) and three standalone events in Paraguay (Asunción), Peru (Lima) and Chile (Santiago). The 2017 edition of ULTRA MUSIC FESTIVAL saw RESISTANCE™ dominate not one, but two huge stages at Bayfront Park, expanding into a unique festival within the festival. In addition to welcoming back the SPIDER across all three days of the event, RESISTANCE™ also announced Carl Cox as its global ambassador. 2017 also saw the reveal of the RESISTANCE™ eight-week Ibiza residency at the world’s largest nightclub, Privilege. The brand’s residency will run every Tuesday from July 25th until the closing party on September 12th. Shanghai, Seoul and Mexico City have also been added to the rapidly expanding RESISTANCE™ global calendar, taking place in September and October respectively.